Robert Emmel, a former News America Marketing employee and a key witness in litigation against News America, filed for Chapter 7 bankruptcy protection today, likely in response to News America's attempts to recover damages and $1.5 million in attorneys fees from him in a breach of contract action related to disclosure of confidential News America information. As discussed in an earlier post, News America won summary judgment against Mr. Emmel in federal district court on a breach of contract claim based on Mr. Emmel's disclosure of confidential information (though News America lost on several other claims). Mr. Emmel admitted that he sent News America documents to the Counsel for the Senate Judiciary Committee because he believed that News America was engaged in unlawful activity. Mr. Emmel has filed an appeal of the summary judgment ruling to the Eleventh Circuit Court of Appeals. Yesterday, Mr. Emmel filed a motion to stay the district court's order, which would enjoin Mr. Emmel from disclosing any confidential News America information and would require him to return all News America documents that are in his possession. In support of his motion to stay the ruling, Mr. Emmel argues that a well-established public policy exception favors non-enforcement of non-disclosure provisions in the context of disclosures of potential unlawful activity to government officials. According to one Georgia case cited by Mr. Emmel, "[r]eporting criminal behavior is expected and even demanded of the ordinary citizen, who should not be discouraged from reporting what he knows to the authorities and from lending his aid to secure evidence of a crime. Indeed, in Georgia it is the duty of one having such information to report it to those in authority." As I have previously argued on this blog, whistleblowers should be provided positive incentives for reporting wrongful activity, not punished for doing so. While corporations like News America have legitimate concerns about avoiding the disclosure of trade secrets and other confidential business information, those concerns do not apply to disclosures to governmental authorities. Mr. Emmel's case provides an example of the disincentives of becoming a whistleblower. The lawsuit against him has led to him filing bankruptcy, and he has devoted substantial time and energy to the litigation against him, as well as to testifying in litigation against News America. 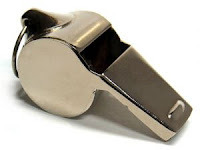 While some whistleblower laws, such as the qui tam statute, allow whistleblowers to reap financial rewards for their efforts, none of those laws appear to apply to Mr. Emmel, who should be commended for his efforts.